Recently at the Payneham Library a new book on display caught my eye. 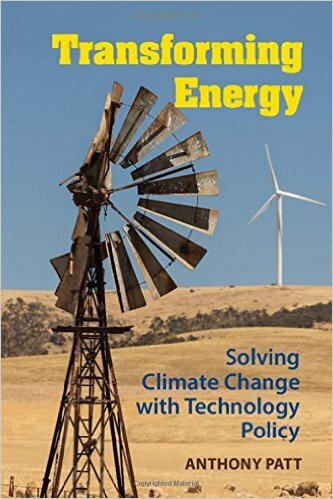 The cover features a typical South Australian scene – an old broken windmill in the foreground with a new wind turbine behind. I borrowed the book. The author, Anthony Patt is Professor of Climate Change Policy at ETH Zurich. His thesis is that there are ways to avert catastrophic climate change, but that some of the currently favoured strategies to address this will not succeed in time. He says that carbon taxes or carbon trading and similar approaches to achieve reductions in energy use have not worked and are unlikely to in the future. He writes that reaching global agreement is difficult to do, although his book was published prior to the Paris Agreement in December 2015. Addressing current First World lifestyles is also difficult because it requires everyone to make sufficient lifestyle change to be effective in reducing carbon emissions – and this is unlikely to happen. Something else has to do the heavy lifting to have the required impact. Professor Patt says that technology now has the possibility to reduce our carbon use enough to make a difference. The large scale adoption of renewable energy systems is now possible with the drop in price of Solar Photo Voltaic (PV). Other developments in solar thermal, wind power and battery storage are promising, but need to be supported with policy settings that safeguard early adopters against financial risk. For example, policies favouring feed in tariffs have made Solar PV successful in South Australia and Germany and China. Professor Patt believes that electric cars can de-carbonise the light transport sector and biofuels can contribute in heavy transport and planes. Some energy intensive industrial processes can be re-engineered; for example cement production may be replaced by geopolymer which can be formed at room temperature using industrial waste or by-products. The big challenge is to convince us and especially our governments to embrace policies that will promote the adoption and widespread use of new non-carbon technologies. Professor Patt’s book is very readable with great stories from his own experience. I did skip the chapter with the hardest technical data in it, but I put down a detective novel to read it! It is recommended and available in our public library network.